Although this is MY Big Fat Halal Blog, I’d be lying if I said I did this all by myself. I would have zero posts up if it wasn’t for my mum digging out her best dishes so that I can display my foods nicely, my dad being a great food taster, my aunty sending me WhatsApp messages with recipe suggestions, or my uncle literally acting as a human shield from the sun, just so that I can get a pretty picture with good lighting! 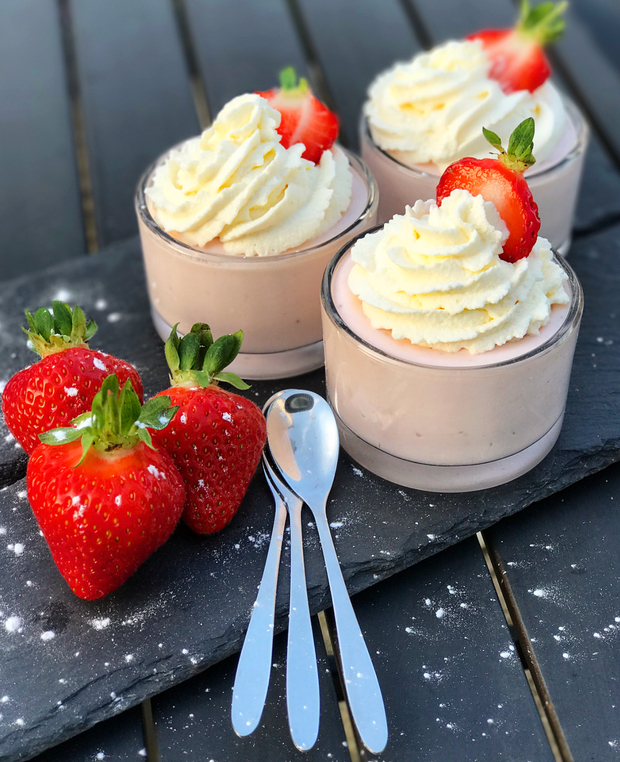 In fact, all of this happened just yesterday in order for me to put up this strawberry mousse recipe! So… from me and my big fat family, I hope you enjoy this yummy recipe, which is perfect for summer and will make a great refreshing Eid dessert! P.S. This is day 3 of my Eid recipe series! Click here for day 1 and here for day 2! Blend the condensed milk, lemon juice, icing sugar, strawberries and cottage cheese together. Add 1tsp of vanilla essence to the cream and whip until medium to stiff peaks form. Fold about 2/3 of the cream into the strawberry mixture. Divide the mixture into serving dishes. Pipe the remaining 1/3 on top and decorate with strawberries.